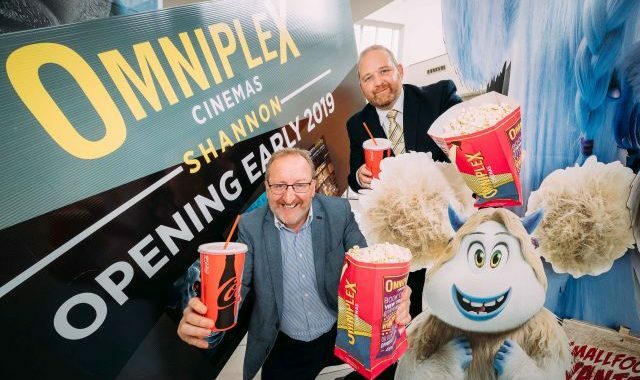 Skycourt Shopping Centre has announced that Ireland’s largest multiplex cinema chain, Omniplex Cinemas, will open in early 2019. The 5-Screen Cinema will be located on the first-floor level of the shopping centre in the former Food court. Seating capacity from 44 – 153 across 5 screens will be available. This is a perfect location for such a leisure facility and will be located in the heart of the shopping centre with multi-storey car park with 400 spaces available for customers adjacent to the cinema on first floor. Market research has shown that leisure, a cinema is much needed element for the local community and Skycourt are delighted to be able to fulfil this need for the community of Shannon. Skycourt Shopping Centre has a catchment of 40,000 within a 15-minute drive. There have been some exciting new additions, including Iceland opening December 2017 and Dealz expanding their offering to include clothing range Pep & Co in 2018. The announcement of Omniplex Cinemas opening will add an exciting new element to the shopping centre.